I’m having another one of those weeks. You know, the ones where you don’t actually plan anything for dinner, but instead decide around 5:00 that you’ll whip up something amazing while your kid plays the Wubbzy game on PBS Kids‘ website. Amazing quickly becomes palatable, and you thank your lucky stars that you had the forethought to buy fresh herbs earlier in the week because everything is better with fresh herbs. And since you just bought some chicken wings for your dog and they are the only thing defrosted, you might as well throw some on the grill with a little BBQ sauce for the people in your household. 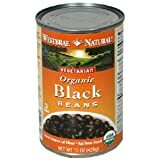 To go with them, how about a black bean and corn salad? It’s easy, tasty and nutritious, and pretty filling so you don’t need to cook a gazillion side dishes. Toss together first five ingredients in a bowl. Whisk together the vinegar, lime juice and olive oil. Pour over ingredients in bowl. It will look like a lot of dressing, but you’ll want it for the next step. Serve over spinach or your choice of greens — see, now the extra dressing coats the greens and it’s big on the yum factor. And if you’ve got some extra chicken wings laying around, serve ‘em up.